2.3.2 Disable a single post from sending to a specific social profile. 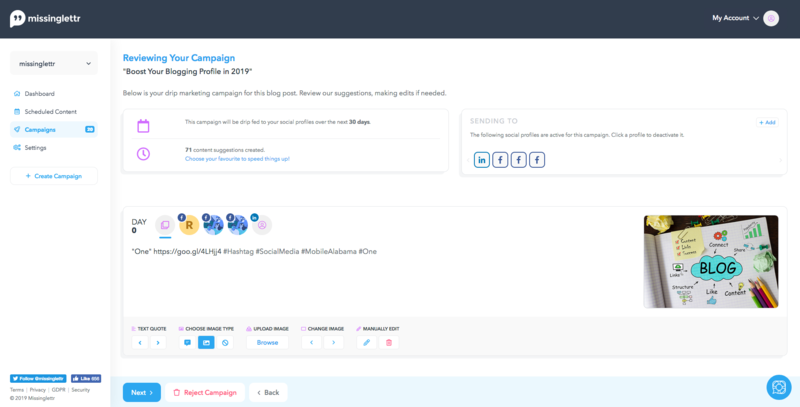 Campaign review is a step that allows you to edit approve the content of each campaign that will be posted to your connected social profiles. This article will cover all aspects and options available within Campaign Review. 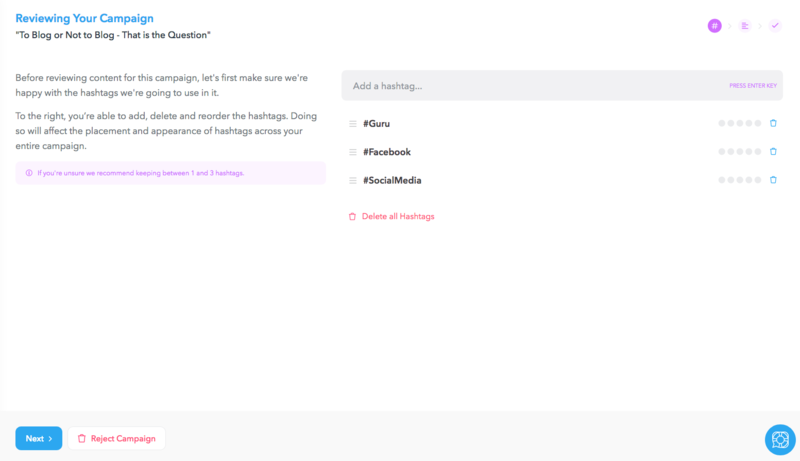 The first part of campaign review allows you to configure the hashtags used in this campaign. Based on your content, an AI method is used to determine the optimal hashtags for the campaign. The red circles determine the popularity of a hashtag. Once you are happy with them, click 'Next' in the left right corner to proceed to the following step. Hashtag priority is determined by the position of the hashtag in the list. Moving hashtags to the top of the list increases their priority. Hashtags with a higher priority will be in your social posts more frequently. The second step consists of all the content we've managed to extract from your blog post, combined with images, quote bubbles and content templates, distributed across the campaign posting days and social profile variations. Posting days and distribution is controlled by schedule templates. When posting to social profiles, Missinglettr can send link cards, text or an image with a description. "Just text" posts with links will be resolved into link cards. "Just text" posts without links will be published as plain text. Quote bubbles use your content and quote bubble templates to create a cool branded image. We will detect all images larger than 150x150px within the body of your blog post and add them to your campaigns automatically. While approving a campaign, you can control which post goes out to which social profile, or disable a social profile from a campaign entirely. Simply click the social profile icon in the 'Sending to' menu. Once disabled, the social profile tab will be removed from posting days. You can add them back by enabling the social profiles in the 'Sending to' menu. Toggling a social profile icon off, will disable and fade out the icon. Content selection allows you to reduce the amount of content your campaign works with and speed up your review process. 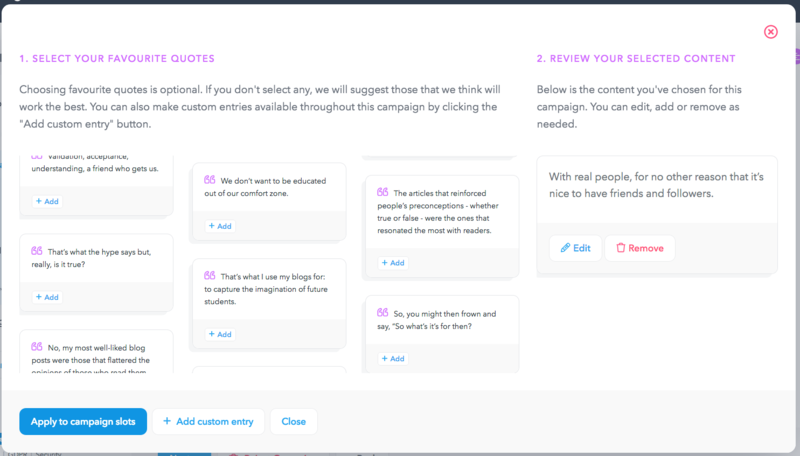 You can select individual extracted quotes which should be included in your campaign, or add manual ones. If the list of selected items is populated, only what is selected will be available in your campaign. If the list of selected items is empty, everything extracted will be available in your campaign. This option will remove any content currently assigned to posting days within a campaign and replace it with the content you have selected. When Facebook posts are present in the campaign, each should be manually approved. It's possible to edit both the post and quote bubble content. Once you are finished with editing a post, click the floppy disc icon to preserve any changes made. Once a post variation is edited, any edits made to the default content or a different post variation will not apply to the previously edited post. 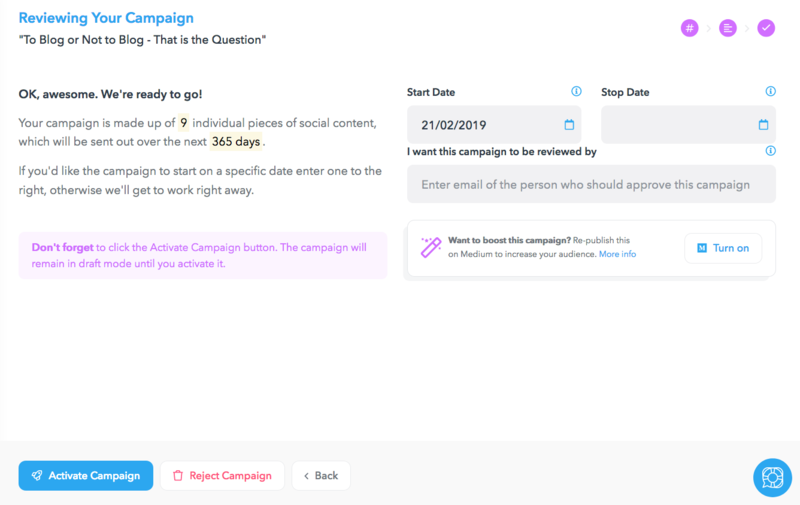 The "start date" indicates when the campaign should start posting - Day0 within a campaign will attempt to get posted on the configured start date. By default, the end date is empty which means that all posts within a campaign will get posted. If you wish your campaign to end sooner, set an end date. Anything scheduled to get published after the end date will not be posted. If you want your clients or coworkers to go through the campaign before it's published, here's more info on external review. If you want your blog posts to be published on your Medium account as well, see here for more info on Medium content re-purposing.